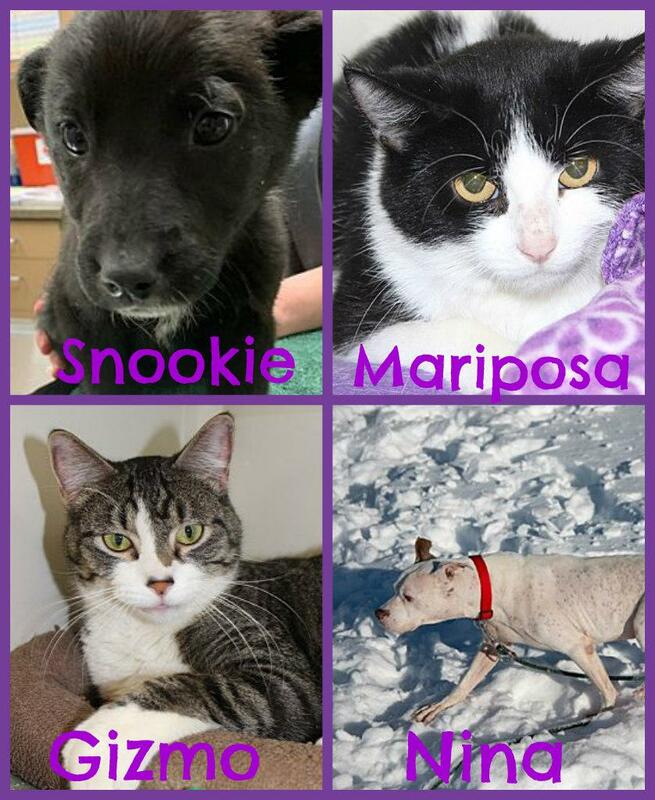 Snookie is an adorable little pup looking for first home. She is only eight weeks old and is eager to find a loving home to grow and play in. Mariposa is a black and white domestic short hair cat who is two years old. She came to us as a stray from Duluth and is now looking for her new loving home! Mariposa is a quiet, shy cat who would love a kitty cave to curl up in. Spend the time to earn her trust and you're sure to have your new best friend! Gizmo is a tabby and white domestic short hair who is 3 years old. He came to us as a stray from Duluth and is now looking for his new loving home! Gizmo is a rad young lad who loves chin rubs. He also enjoys watching the birds outside the window and taking long naps..
Nina is a white and tan American Shelter Dog who is ten years old. She came to us as a transfer from a different rescue and is now looking for her new loving home! Nina is a sweet, laid back lady who would love to cuddle on the couch with you this winter. She knows sit and come already, and would be happy to go for a nice walk before settling in for the day. It's kind of like a balance sheet, actually. Sandpiper is a brown tabby and white long haired cat who is five years old. She came to us as a stray from Duluth and is now looking for her new loving home! Sandpiper has gorgeous soft fur that you will love to pet. She purrs almost immediately when you start talking to her, and enjoys spending time with people. Bosco is a tan Boxer/Sharpei mix who is twelve years old. He came to us from a previous home and is now looking for his new loving home! Bosco is a smart dog who already knows to sit, stay, lay down, and give a paw on command. This sweet boy loves to snuggle, but he'll also play fetch or tug! Tempesta is a female 12 week old short haired kitten looking for her new home!